3 Hardest CFA Level 1 Topics: What Are They & Why? 3. Financial Reporting and Analysis (FRA). Financial Reporting and Analysis looks rather dangerous: 12 readings going over 707 pages, nearly 100 formulas, and all this tested in as many as 36 out of 240 CFA level 1 exam questions. But Fixed Income with its exam weight of 11% looks much less scary, not to mention Derivatives… Topic weight: only 6%. Readings: just 2! (and roughly 120 pages long – or ‘short’ for that matter ;D). But the first tough thing about CFA level 1 topics is to understand that it’s not the length or weight in the exam that makes a topic difficult. It’s its substance. Although difficulty is a subjective criterion, there is an objective reason why these 3 choices are probably correct for the majority of level 1 candidates: all 3 topics are strictly conceptual plus they contain many things you’ve probably never heard of before. What it means is that there’s a lot to remember and this lot may be hard to understand! Have you ever invested in shares? Even if not, you surely know many companies listed on the stock exchange. That’s why equity feels quite concrete and intuitive. But debt securities are not something people deal with on a regular basis (especially if they live in a country where the bond market is not as well developed as in the US). Therefore, studying fixed-income securities is more abstract. Reading 50: explains nomenclature and different types of fixed-income securities. Reading 51: describes bond markets and basic mechanisms. Both these readings are purely theoretical and overrun with terms. Were they to be cut down and made into one Intro reading, not much would be lost in the sense of getting what fixed-income investments are all about. Reading 52: deals with bond valuation. You will read about 4 methods of bond valuation here + some complicated concepts like implied forward and spot rates or yield spreads will be also presented. In one of our videos you'll find below, we explain how to value bonds using different calculator worksheets. Surely, it can help. Reading 53: introduces asset-backed securities (ABS). If you’ve seen Big Short and enjoyed it, the stuff detailed in this reading gets more friendly . Reading 54: unveils the notions of fixed-income risk & return. That’s where the real fun begins! You can’t talk about bond risk & return without getting to know Macaulay duration, modified duration, effective duration, key rate duration, convexity, effective convexity or negative convexity, and duration gap. Most of these concepts take a form of complex formulas + risk & return analysis is all about relations such as: How does the modified duration change if YTM increases? Reading 55: puts a cherry on top delineating credit analysis. So: if you’re not a fixed-income adept and the topic is a hassle for you like for the majority of CFA candidates, we’d like to propose an alternative reading sequence to the one given in your curriculum. It should make your study efforts more effective. 1. Quickly go through Reading 50 (Intro) Scan for some major issues. 6. Go back to Reading 50 (Intro) Read it thoroughly this time. 7. Carefully read Reading 51 (Markets) Fine video available in our paid plan. When you get to know about fixed-income investments, you’ll make a better start at derivatives. Bonds can have an impact on derivative instruments and then there are also options – first mentioned in the Fixed Income topic and examined inside out in the Derivative Investments topic. Get CFA study plan that finally works. Have your CFA readings scheduled into subsequent study weeks. Is it possible at all that the hardest part of the CFA level 1 Curriculum has been hidden in almost the shortest of the topics? Undoubtedly, it is the case for many. The definition of a derivative already points to the problem. You know about a derivative if you know about its underlying asset. "A derivative is a financial instrument whose value depends on the value of some underlying asset." And there is a number of different assets that may serve as underlying assets for derivatives, for example: stocks, stock indices, bonds, interest rates, exchange rates, commodities or other derivative instruments. The change in the value of the underlying asset affects the value of the derivative instrument. The derivatives you’ll learn about while preparing for your CFA level 1 exam include: forwards, futures, options, and swaps. The most challenging task is probably to grasp the idea of how options work. There are various types of options, each with different characteristics. We say that options are contingent claims – the long will exercise the option and require that the short complete the transaction only if this transaction is profitable for the long party. 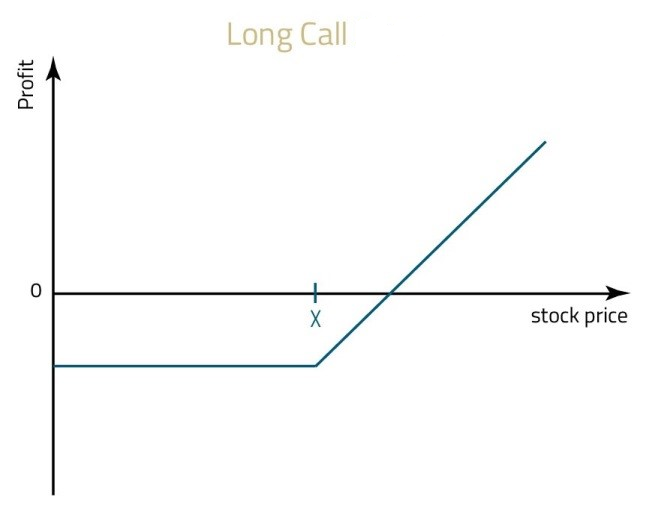 If we were to illustrate the profit from an option, it won’t be a straight line like for forwards or stocks. It makes option valuation extremely complicated. Luckily, option valuation models are left out of the CFA level 1 curriculum (apart from a short mention of the binomial option valuation) and you don’t need to worry about that until your level 2 exam. The main goal with forward commitments is to get the difference between pricing and valuation. Forward price is a fixed price for which the underlying will be purchased in the future. Forward value – on the other hand – is determined for your position in the contract (that you entered some time ago) and it equals 0 (zero) at contract initiation and changes over time can be positive or negative depending on your position (long, short) and the price of the underlying. Of course, getting to know different kinds of derivatives is not all. When you get familiar with forwards, futures, options, and swaps, it’s time to look into more enigmatic issues such as arbitrage, forward rate agreements (FRAs), put-call parity or put-call-forward parity. You get it all explained in our premium videos. Yes, derivatives are much more puzzling than assets such as shares or even bonds. It’s because derivatives derive their value from underlying assets like shares or bonds. However, if you feel that options – which are probably the hardest of the hardest DI stuff – are not your story, you can always give up on them. It’s unlikely that your success in the exam should depend on this one decision. The topic has little weight in the level 1 exam and options are just part of it. You don’t need to study every issue to perfection if otherwise you spend your study time effectively. If you’ve had little or nothing to do with financial statements, FRA is going to give you some hard time. For the level 1 exam, it’s a lot of theory describing a vast range of accounting concepts. The first 2 readings deal with different frameworks, reporting standards, and authorities associated with financial reporting and analysis. The next 3 readings are devoted respectively to the income statement, balance sheet, and cash flow statement, i.e. the main 3 financial statements. Then, there’s a reading on various techniques used in accounting, followed by a number of readings elaborating on different financial statement items, e.g. inventories. The last 2 readings are about quality and applications. The greatest difficulty about the topic of Financial Reporting and Analysis is probably not the content itself but rather the abundance of the information. First of all, there are various differences and similarities to acquire. Take inventories. They are treated differently depending on whether they are reported under IFRS or U.S. GAAP. You can have it all cleared up with our IFRS vs U.S. GAAP e-book. Moreover, there are plenty of ratios to take in. If you take into consideration one very significant thing about the FRA questions in your exam, you’ll understand why ratios can be a real trouble. This thing is data irrelevance. By data irrelevance we mean that very often FRA questions contain lots of data, some of which are totally insignificant for solving the problem. If you do not know exactly what elements you need to calculate the appropriate ratio, you won’t be able to cope with the exam question. Excessive data also means more challenging analysis. You have to be able to interpret the data you see and judge its impact on the problem you’re dealing with. How can a change from financing to operating lease affect the company’s cash flow from operations? To be able to approach this kind of problems, you need to understand what a given change means and whether it has any important influence. If yes, then you need to know what it is that the change affects and how it affects it. Is Financial Reporting and Analysis the hardest topic of CFA level 1 exam? But it might be as well Fixed Income with its debt securities, Derivative Investments with its options or any other topic as a matter of fact. It’s an individual matter. If, however, it proves for you to be FRA – do not surrender but find a way to overcome the difficulty. It’s definitely worth it because it’s one of the most important topics in your CFA level 1 exam. Think about it this way: no effort spared on FRA is lost. The better you cope with the topic now, the greater the chances of success in your level 1 exam. Plus, it will surely pay off when the challenges of the level 2 exam get real.